Have you ever started to make tacos for dinner and then suddenly realized that you’re completely out of those little packets of taco seasoning? Well, necessity is the mother of invention as they say. Last time I found myself in this predicament I got super frustrated (I mean my whole dinner plan was ruined after all)..and then I thought surely I could make my own taco seasoning? Thankfully, a quick Pinterest search for homemade taco seasoning totally saved me and I was on my way in no time. How did we ever live without Pinterest? I’ve now made this seasoning a couple of times and realized it was about time I shared it. This taco seasoning was super quick to throw together and we now have a little container of the mix ready to go. 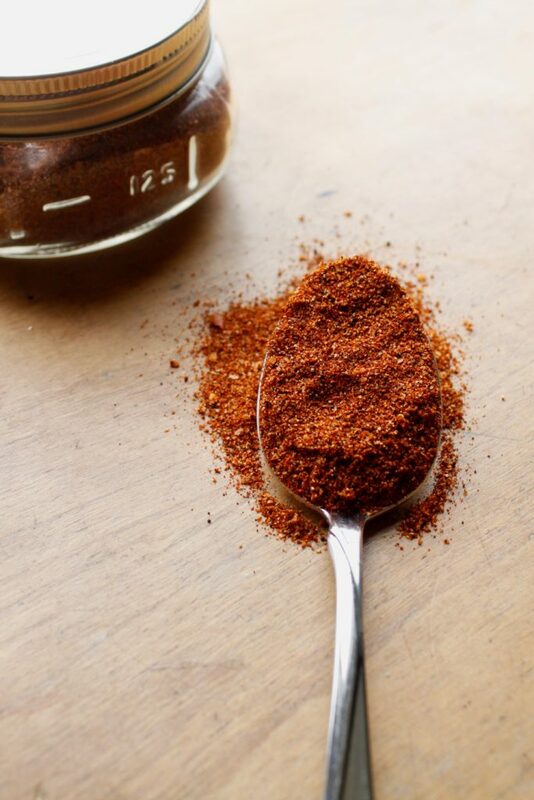 I love knowing what all is going into our food and this homemade taco seasoning mix packs the perfect flavor for our Tex-Mex inspired dishes. And who doesn’t like saving a little money? I don’t think we’ll be going back to the taco packets anytime soon. So the next time tacos are on the menu make your own taco seasoning and let us know what you think! Use as little or as much seasoning as desired. * Makes about 3 Tablespoons. I tripled the recipe to store in an airtight container until the next time we need it.